Jesima is a striving 49 year old mother who lives in Hijrapuram, Mullativu with her four children (3 daughter & son) and husband Sanootheen. One daughter is sitting for her ordinary level examination and others are studying in Grade 9, 7 and 2 in respectively. Her family is big in size of members and faced economic difficulties when they resettled where in 2010. 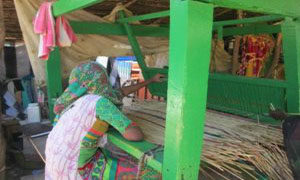 Due to the family burden she was stared her traditional handloom mat weaving industry in a small scale with the support of loan LKR 35000,00 was provided by MWRDS in 2014 (Mullaitivu Woman Rural Development Society). Through the initial capital she could able to buy machineries and built a temporary shed to carry out the weaving industry. 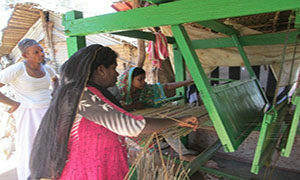 During the initiation of manufacturing of mats she faced difficulties to get the raw materials. Due to the issue of transportation cost. At the same time she could able to produce 300 mates per month and end product is also marketed with high transport cost. Though her income is deficient to full fill her family’s basic needs as well as lacking to support in education of the children. In addition to this in November 2017, again she obtained LKR 50,000 loan to enhance her livelihood from MWRDS. On the other hand of loan receiving that the economic crisis have minimized than before. Afterwards she would able to store sufficient raw materials to produce 600 mats for a month. As a result of the wages for the Lorry (transport Raw Material) has reduced by half because the times of transport and production. Mats production are increased in double. At the same time she mentioned that her production cost is reduced by half and upturn could notice through the sales income. Her daily wages is satisfactory to run the family happily. On the other hand there is no permanent building, for the moment she carry out her industrial activity in a temporary shed. At present there is problem to safeguard the raw material as well as end product from the rainy seasons. In future she is going to build a permanent house from a Government/ Other housing projects. Then planned to shift the handloom machinery to that permanent building and hoped to earn sufficient income through is small entrepreneurship. She thanks to MWRDS and says “This livelihood support has helped me to increase the income and I could earn 1000/= rupees and saved 300/= rupees per day. My earnings are manageable to cover day to day household, medical and schooling expenses”. I have a plan to magnify my manufacturing in a large scale in future”.